President visits tsunami islands Jump to media player Indonesian President Susilo Bambang Yudhoyono has met survivors of the tsunami that hit remote islands west of Sumatra, killing 343 people and leaving many missing. 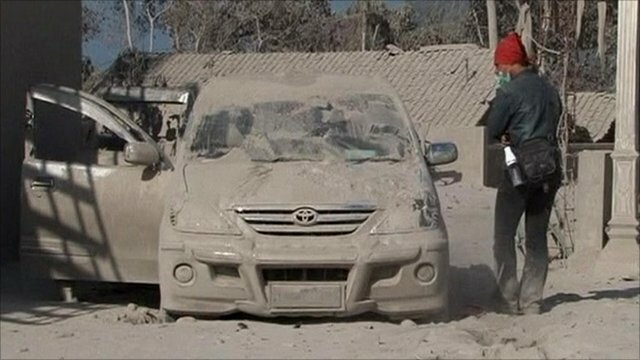 'Ash on the road, cars and buildings' Jump to media player The death toll following the eruption of Indonesia's Mount Merapi volcano has risen to 25, officials say, amid fears of fresh eruptions. Indonesian President Susilo Bambang Yudhoyono has met survivors of the tsunami that hit remote islands west of Sumatra, killing 343 people and leaving many missing. Rescue teams are now at work on North Pagai island in the remote Mentawai Islands off western Sumatra. Local officials say most of the villages hit by the tsunami have been reached, with victims from the worst-hit areas being buried in mass graves.